You really can crowdfund anything these days. Big filmmakers have turned to this avenue as a way to fund movies studios and other traditional investors pass over, all kinds of gadgets and gizmos would never see the light of day without this strategy, and you even see all kinds of businesses acquire their start up capital this way. You can even finance your trip to the Moon if you’re so inclined, which is a feat that one intrepid group of would be space explorers just successfully accomplished. 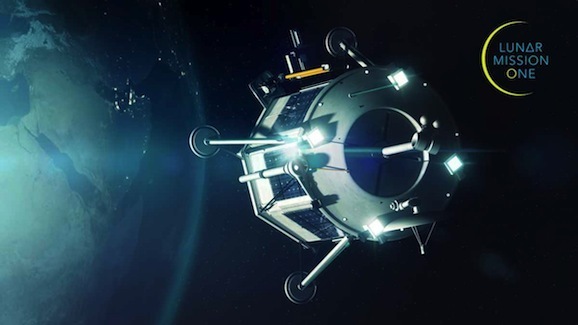 The U.K-based collection of scientists and engineers known as Lunar Mission One recently hit their target goal of 600,000 pounds (roughly $1 million U.S.) on Kickstarter, reaching their goal with more than a day to spare (they ultimately hit 672,000). With more than 6800 backers, their ultimate aim is to send a robotic probe to the surface of the moon in order to drill and perform research. Mushrooms are seriously weird. Fungi have properties unlike those of other organisms—or don’t have certain properties, as the case may be. They lack a respiratory and digestive system, and their food digestion happens outside their bodies. They like eating dead things, and eating certain mushrooms can make the adventurous but ignorant forager into a dead thing. 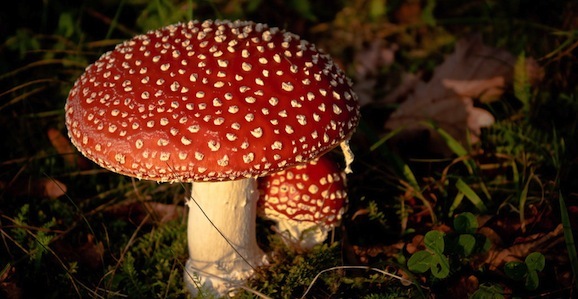 It’s that poisonous quality that has led researchers at Michigan State University and China’s Kunming University of Science and Technology to discover that killer mushrooms might end up leading to groundbreaking medical treatments. The study, published in Chemistry and Biology, details how the researchers were able to isolate and identify a particular enzyme that causes mushrooms’ toxicity. The enzyme creates molecules called cyclic peptides, which hone in on the human liver and attack a specific part of it, poisoning the consumer. Cyclic peptides have become popular with pharmaceutical companies, which synthesize them in the lab and then use them for a whole range of treatments—they’re used as antibacterials, immune-boosting drugs, and tumor-fighting drugs. They have a high resistance to the human digestive process, so they stay intact and remain effective after ingested. While scientists are confident that the universe began in a big bang, they’re not sure how life actually came to Earth—likely, it arrived on a comet, asteroid, or a meteorite , perhaps even from Mars. One of the ways scientists deal with questions of the unknown is to try and simulate mysterious events or processes with computer simulations. But in this latest case, scientists used a laser to try and recreate what may have been the first life on Earth. Given that scientists don’t have access to asteroids to hurl down into the primordial ooze, they had to try and replicate that force and energy. 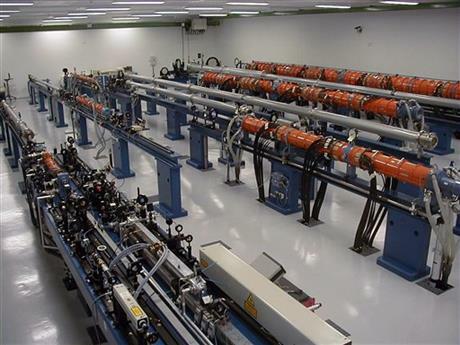 For this experiment scientists from the Czech Republic and from the Southwest Research Institute in Boulder, Colorado used a laser, which they directed at clay and a primordial chemical soup. What they ended up with seemed, at least to them, to be the origin of life on Earth. One of the biggest breakthroughs in computer science has been the ability to simulate human neural networks via programs and algorithms, thereby combining the power of artificial intelligence with the computing power of the human brain. This advancement will aid in creating artificial “superintelligence,” as well as figuring out how the human brain works in an attempt to simulate it — and perhaps consciousness itself — in a machine (which scientists recently did with a worm). 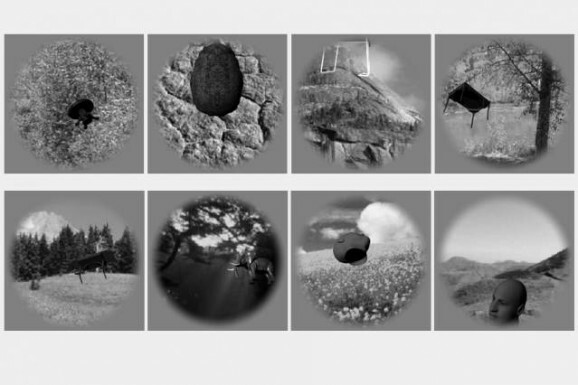 One specific aspect of mimicking human neural networks that has been particularly challenging is vision and object recognition, which has recently yielded some impressive and promising results, and now has taken another leap forward. Neuroscientists at MIT recently conducted a study that indicates that recent advancements in “deep neural networks” allow computer networks to see and recognize objects just as well as primates. GFR has done a lot of reporting on the breakneck pace of the prosthetics development, including mind-controlled prosthetics and exoskeletons. It’s mind-blowing to think that someone without a limb can simply think/desire to move a bionic replacement and it will do just that, including allowing a paraplegic teen to kick a soccer ball. Now, in yet another first in the field, a double-amputee has become the first person in the world to control two prosthetic limbs at once. 40 years ago, Les Baugh lost both of his arms in an accident. He recently received two of Johns Hopkins Applied Physics Laboratory’s Modular Prosthetic Limbs, which look and feel like regular human arms; possess similar strength and flexibility; have over 100 sensors that aid in touch, pressure, and positioning; and connect to a wearer via a neural interface. 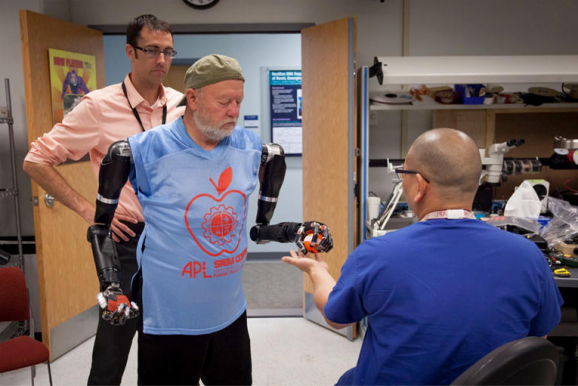 In order to be fitted with the prosthetics, Baugh had to have target muscle reinnervation surgery—a recent surgical breakthrough that readies the nerves for connection to the arm by “reassigning” them. Animals are known for their ability to sense inclement weather before it arrives—horses get agitated, dogs get hyper and weird. As skies darken and wind kicks up, animals generally demonstrate that they know something’s up. 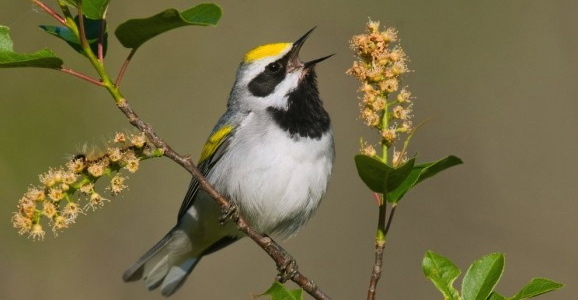 But a new study on golden-winged warblers suggests that birds may have weather forecasting abilities that far eclipse anything we’ve previously observed. Back in April, severe weather, including tornadoes, ripped through the Great Plains. In Tennessee, the warblers were busy breeding, when suddenly they took off and headed to Florida. Either they wanted to retire and play shuffleboard, or something else was going on. In a study published in Current Biology, researchers from the University of Tennessee and the University of Minnesota theorize that the birds were able to hear the incoming storms more than 24 hours before they hit thanks to something called “infrasound,” which is a low-frequency noise humans can’t hear.